The Honda Aircraft Company, a subsidiary of the Honda Motor Co., Ltd, is based in Greensboro, North Carolina, United States. The HondaJet is built in Greensboro North Carolina at the Honda Aircraft’s headquarters. Honda Aircraft Company’s headquarters is located on the Piedmont Triad International Airport (FAA: GSO, ICAO: KGSO) in Guilford County. All of the company’s buildings are located on the south side of the airport, which is located on the other side the main passenger terminal at the airport. This is the HondaJet Greensboro North Carolina location. The Address of Honda’s Greensboro location is 6430 Ballinger Rd, Greensboro, NC 27410. Above map of the HondaJet Greensboro North Carolina location at the Piedmont Triad International Airport by OpenStreetMap Contributors. Map was modified by FlyRadius to add additional information about the location. Honda Aircraft Company does not own the land on which it is located on. 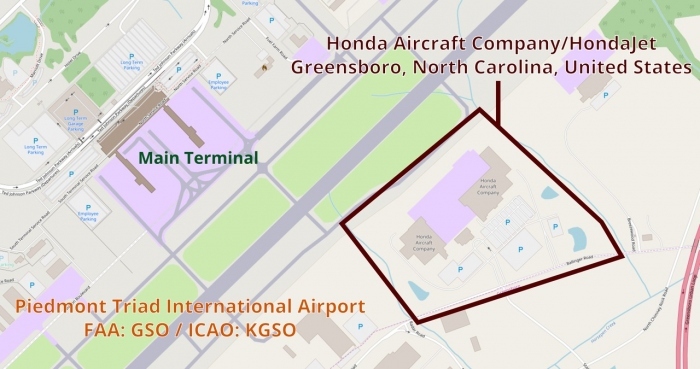 The airport, Piedmont Triad Airport Authority owns the land and leases it to the Honda Aircraft Company. This a standard procedure at United States public airports. The Honda Aircraft Company started building their headquarters in Greensboro, North Carolina on June 27, 2007. It is estimated that in 2011 most of the buildings for production of the HondaJet were completed. By 2013 all of the buildings were completed, which included a Maintenance, Repair, and Overhaul facility (MRO). Honda teamed up with General Electric (GE) to build the engine for the HondaJet. They both created a new company, GE Honda Aero Engines LLC, to be the new manufacturer of the HondaJet Engine. GE Honda elected to build their aircraft engine facility in Burlington, North Carolina, which is close to Greensboro. Honda also has their Honda Aero, Inc subsidiary based at that location. At the Burlington facility GE and Honda have teamed up to build aircraft engines. GE Honda Aero Engines is focused on producing the HF120 engine, which is the engine that powers the HondaJet. In addition to the main name for the aircraft, the HondaJet also has other “official” names. Below are some of the additional names for the jet. Honda Aircraft HA-420: The HondaJet is officially known as the HA-420. Aviation regulators use the name HA-420 to identify the aircraft. Honda HDJT: HDJT is the 4 place alphanumeric identifier for the aircraft the FAA is using this code to identify the aircraft for air traffic control operations. HDJT is also the ICAO identifier for the light jet.